Rich Cronin has been a major New York Yankee fan for as long as he can remember. Growing up, he was also an artist and had aspirations of being a cartoonist until the reality of making a living took its hold. However, he always maintained his artwork but did not combine art and sports until he became involved in fundraising for autism education. His son David was diagnosed with autism at the very early age of 18 months. The costs and time needed to bring a non existent education for him into the household placed memorabilia collecting and artwork the furthest from his mind. Unfortunately, he lost his son in Sep of 2002. Since then, he has made significant efforts to raise money and awareness for autism as well as the need to build effective schools and treatment programs. Suddenly, his art and memorabilia became the perfect medium to start raising funds. He started making shadow boxes for signed baseballs and bats, making paintings and finally the mosaics for fundraisers. They all received their praise, however, the mosaic of Babe Ruth captured everyone’s attention. After a few years, the mosaics ran their course and I retired them from the fundraisers while entering other pieces of Ruth Pop art. However, everyone’s interest in the mosaic’s still remained and people started to convince me to bring them to the public. The combination of this piece of artwork and Babe Ruth Central became a perfect match. Being a part of a family that is primarily from the Boston area, it doesn’t come without its price. When I was young, I remember listening to the Yankee games on the radio or secretly watching them on TV and always running out to collect the next group of baseball cards that contained the worlds worst gum; then throwing out any card that wasn’t a New York Yankee. The mystique and heritage of the Yankees just captured me for some reason. Growing up in an era when the Yankees weren’t doing very well, the comic books always pointed to the great heroics of Mantle, Gehrig, and of course Ruth. This is where my interest and the love of the ”Babe” became firmly established. I am not an artist by trade but I am an artist at heart. My aspirations of being an artist slowly withered away at a young age when the reality of earning income came into play. It is very difficult to become an artist and maintain a livelihood. I have always maintained keeping up with my paintings, drawing, sports creations, etc. but I kept this up purely as a hobby. When my son was diagnosed with autism, any and all creativity ceased as the cost of an education for a child with autism is astronomical. It has become ironic that after my son’s passing, that the art that could not be done is now helping schools to educate their children. I started creating mosaics as a challenge from my oldest son. We would see a painting, or a sports themed shadowbox or something similar and would always say, “Can you do that for an autism auction?”. We had a large collection of Topps Micro Baseball cards as we had been collecting sports related material for some time. His challenge for me was to create an iconic player out of them. 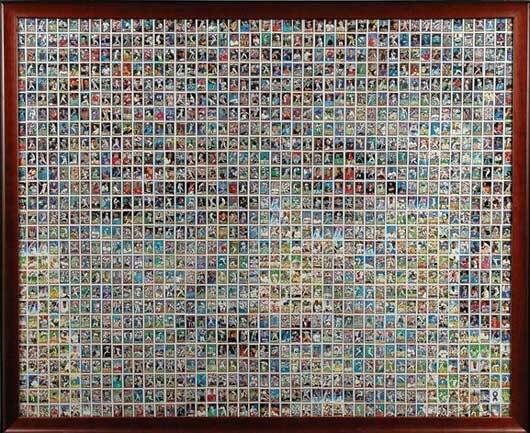 My first mosaic was that of Mickey Mantle. Very quickly there after, I started creating several other baseball greats including Lou Gehrig, Ted Williams, Derek Jeter, and then ultimately Babe Ruth. They can all be considered the original series that I still have in storage. Some worked out well, and others you really needed to make significantly larger to understand the detail and identify the athlete. Creating and then maintaining the production of the Babe Ruth mosaic was simply a “no brainer” for me. He is the single most identifiable person in baseball, making the mosaic identifiable to everyone who sees it. There have been several baseball players throughout history that have special meaning in people’s hearts; Gehrig, Mantle, and several others can easily be contenders as one of the greatest players of all time. I have been creating sports and music memorabilia related products for several years now. I have been doing so in support of autism education and awareness charities within New York and New Jersey . My son David was diagnosed with autism at the early age of 18 months. This was a very difficult time in our lives to say the least. We gave everything we had for his education that was quickly rising to over $65,000 a year. Although we have lost our battle with autism in September of 2002, I recognize that so many people around us still continue to have the same financial struggles in their lives as we had in ours. I host, as well as help coordinate many autism charity events in the New York and New Jersey areas to support fundraising for autism education so that the burden of the cost of education to a family with autism can be addressed. The mosaic was simply one piece in a line of sports memorabilia and art that I provided for an auction. It met with astounding reviews and raised a lot of money for the school who had held the event. Babe was a controversial person in his day, there is no doubt about that. There was just as much bad press about him as there was good press. But the one thing that he did that I feel that defines him as true “ Americana ” was that he unified baseball and the love that people had for the sport. He was an athlete during a very troubled time in baseball history as well as a financially difficult time for America . In an age where mass media was not as dominant as it is today, he got out there to befriend the public, spend time with young aspiring children who wanted nothing more then to be Lou Gehrig, Ted William, Ruth and the like. This is obvious, especially with today’s controversies of steroid abuse. In Babe’s day, the controversy that tarnished baseball was the “Black Sox” scandal in which several baseball players of the Chicago White Sox, including “Shoeless” Joe Jackson, were indicted for throwing the 1919 World Series against the Cincinnati Reds. Baseball was seemingly tarnished forever as it lost its faith in the American public. With Babe joining the Yankees in 1920 from a trade with the Boston Red Sox, a new story in baseball was about to begin. His home run feats were driving people back into the stands. His efforts as a player could not be challenged or scrutinized as was done the year prior. More so, Babe saw the importance of getting out to the public and instilling the love of the game back into the hearts of the young aspiring children of the day, by handing out memorabilia, signed baseball and the like and meeting people on the street. We don’t see that today. With the steroid scandal dominating the press today, we don’t have a player that is standing out in the crowd, drawing the people in with confidence. This however, is a bit harder to do and perhaps not a fair comparison as anyone can be scrutinized for taking performance enhancing drugs. Nowadays they seem to be guilty before proven innocent. In 1920, Babe clearly defined by his actions and feats, that he, nor the New York Yankees subscribed to cheating. That winning through ability was going to be the cornerstone of the New York Yankee tradition. If you’re interested in purchasing a Babe Ruth Mosaic, please visit the BR Store.